It was gathered that the demand was made by the coalition following the recent revelation by the All Progressives Congress (APC) that Atiku is a nationality of Cameroon and not a Nigerian. Hassan further said the coalition was giving the PDP presidential aspirant a 21-day ultimatum to return to Cameroon to reunite with his family members. 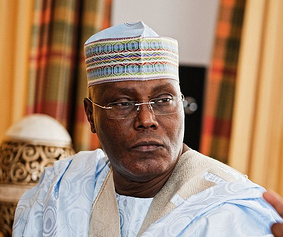 “The Conference of Minority Tribes in Nigeria is indeed alarmed that the paternity of Alhaji Atiku was unlet undetected and he aspired and held the number two position of Vice President in Nigeria,” Hassan said. Hassan also said that Atiku’s relationship with Simon Ateba, a Nigerian based Cameroonian journalist who was arrested in Cameroon leaves more to be imagined. “Consequently, the Conference of Minority Tribes in Nigeria wishes to use this medium to issue a 21-day ultimatum to Alhaji Atiku Abubakar return to Cameroon to reunite with his family members. This is important to save Nigerians the trauma of having to deal with his nationality. The Conference of Minority also wishes to advise Alhaji Atiku Abubakar to in an alternative solution seek naturalization as a Nigerian by applying to the Federal Ministry of Interior in Nigeria. This way Nigerians would forgive him for his sins and show him understanding since he has lived the better part of his life in Nigeria,” Hassan added.